You are here: Home » Pumpkin-Flavored Everything Season is Here! Pumpkin-Flavored Everything Season is Here! Well, here we are. It’s that time of the year again. The heat index is dropping, it’s starting to get a little darker a little sooner, and suddenly everything is red, brown, and pumpkin all over. Fall is here…almost. Although not technically starting until September 23rd this year, beginning about a week ago, many retailers and restaurants began doing their best to convince you that we’re knee deep in leaves and chilly temperatures already. Being a marketer’s dream, I of course buy into all of the hype every year, which allows me to speak with some amount of confidence on the top pumpkin treats that you should try. Ready to dive in? One of the most popular ways to get seasonal is with your coffee. 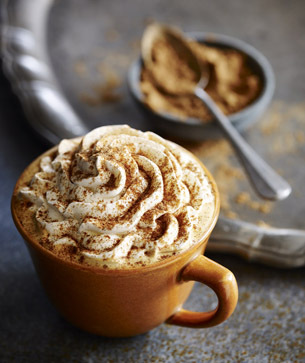 Quite possibly the most recognizable Fall treat, Starbuck’s didn’t wait this year and brought back their Pumpkin Spice Lattes on August 25th. I know that sipping a PSL is so cliche and standard at this point but how are we suppose to help ourselves when they are so good? They’re the most popular seasonal drink in Starbucks history for a reason—creamy, sweet, and just spicy enough to make you feel like it’s fall even though it’s still August. It just would not be fall without them. But if you are looking for something a little less “obvious” and you’re lucky enough to be in a place where Dunkin’ Donuts exists, they have a plethora of pumpkin themed food and drinks coming out tomorrow! Pumpkin coffee and lattes, muffins, and doughnuts have always been a part of their lineup but this year they’re really getting serious. DD is adding pumpkin mochas, pumpkin creme brulee lattes, and pumpkin creme brulee doughnuts to their lineup this year. I’m not a big fan of DD’s pumpkin lattes, but I love their pumpkin coffee, and am currently counting the minutes until I can try their creme brulee latte. For those of us with a major sweet tooth, now is the time where we use all those PSL and pumpkin coffees to keep our eyes open and peeled for any sort of pumpkin candy. If M&M’s are your weakness, Target already has you covered—they’ve got Pumpkin Spice M&M’s back in stock. These are a Target exclusive and tend to go fast (when I picked them up on Saturday there were only 4 bags left) so I would hurry and stock up before they’re gone. These are yummy as a snack or dessert on their own but if you bake as much as I do, you’ve got to put these into cookies. Or brownies. It’s absolutely delicious and probably what I am doing tomorrow. Not to be outdone, Hershey has their pumpkin bases covered with their Pumpkin Spice Hershey Kisses. These are there normal milk chocolate kisses with a pumpkin creme center and are…addicting. The sweetness of the milk chocolate combined with the cinnamon-y and nutmeg-y of the pumpkin creme makes it dangerously easy to eat quite a few in one sitting. If I’m not doing that, my favorite way to eat these is to make the classic peanut butter kiss cookies with them. Peanut butter and pumpkin might sound like a strange combination but it’s really not — you should give it a shot. So you’re not a coffee drinker but would like to get into all the seasonal beverage fun? 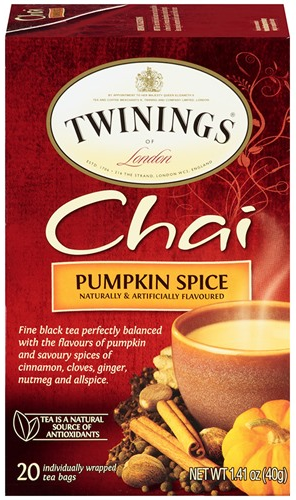 No worries, Twinings has a comforting Pumpkin Spice Chai tea that’ll do it for you. With it still being hot outside this might be one to hold off on for a month or so until it gets cooler. All the spices in this tea make it such a great way to wake up on a chilly morning. I’m not the biggest tea fan and I love this tea, so if you feel the same way, I’d encourage you to try it out as well. On the flip side, for a drink to enjoy as you wind down from the day, Pumpkin Beer is where it’s at. There are quite a few out on the market, lots of them are very good and it all comes down to personal preference, but I’m a big fan of Samuel Adams Harvest Pumpkin Ale. It has a nice ginger flavor (which is what I’m obsessed with) and you can really taste the cinnamon in it as well. Last year I ended up putting it into a batch of pumpkin scones that I made and it wasn’t my worst decision ever, but it was my best decision ever. What pumpkin inspired food or drink are you most looking forward to?